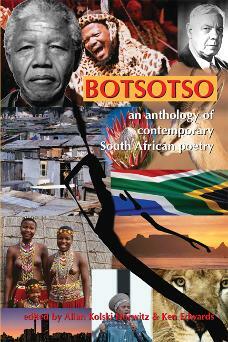 BOTSOTSO was founded in South Africa in 1994, following the end of apartheid, by the Botsotso Jesters, a poetry performance group. Its first printed manifestation was as an insert in the New Nation, a now defunct weekly newspaper. Following the newspaper’s demise, Botsotso became a magazine in its own right and a publishing house. This anthology of 12 poets gives a platform outside South Africa for the first time for this adventurous, multi-cultural inter-disciplinary literary and art project. An exciting anthology of contemporary multi-lingual, multi-cultural poetry from post-apartheid South Africa, showcasing some of the poets who have come to prominence since 1994. The contributors are: Donald Parenzee,Makhosazana Xaba, Bongekile Mbanjwa, Vonani Bila, Kobus Moolman, Anet Kemp, Allan Kolski Horwitz, Ike Mboneni Muila, Lisemelo Tlale, Clinton du Plessis, Sumeera Dawood, Siphiwe ka Ngwenya. The anthology has been edited in collaboration with Ken Edwards, of Reality Street, who also writes a preface. Co-editor and Botsotso founder Allan Kolski Horwitz contributes an introductory essay providing the political and social context.